StoreApps	is ready to help you get the answers you need. StoreApps	will reply to your questions about Get extension name	shortly. We appreciate your feedback about your support experience with StoreApps, developers of Smart Coupons. This helps us maintain high standards on the WooMarketplace, and helps StoreApps improve. Glad to hear it went well with StoreApps. Tell us more. Did StoreApps get back to you? Do you have any additional feeback for us or StoreApps? 10,000+ customers and 5+ years track record. 99 out of 100 people who come to your site run away without spending a penny. Yes, the site you built with lots of money, time and emotions. Yes, the same people who came to your site after your endless marketing efforts. Now listen, people will tell you about hundred ways to improve conversions and loyalty. But three methods are absolutely essential. You got to use them before you anything else. Now you can’t magically improve your product images overnight, but you can certainly “kill it” with the other two tactics in just a few minutes! Everyone loves to get more than what they pay for. Which is why discount coupons and free shipping give such wonderful results. And WooCommerce Smart Coupons plugin makes it a piece of cake to create, issue and manage everything around coupons, credits, and gift certificates. It is like Jedi marketing powers for you! Here are some of the main reasons why people use Smart Coupons. 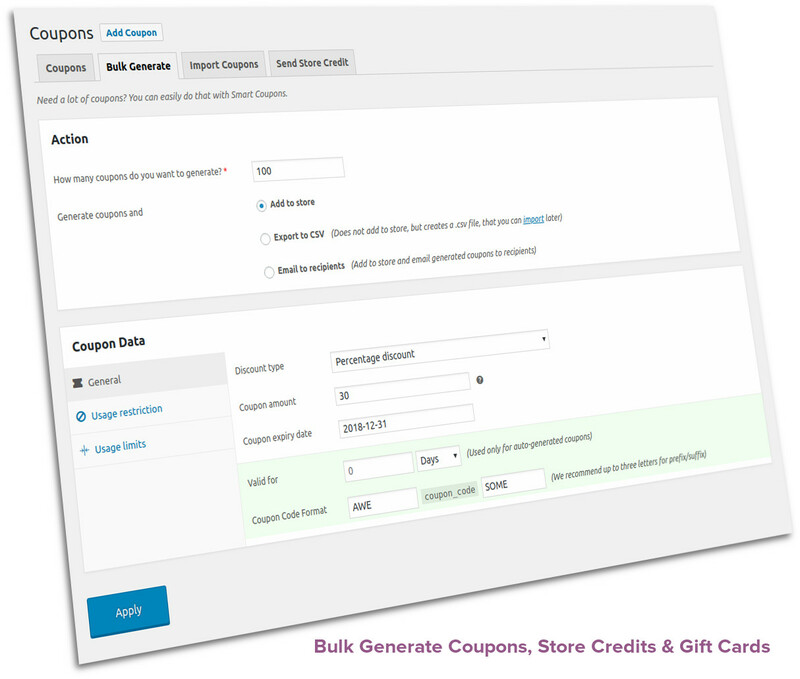 Automatic bulk coupon generation and dispatch – generate thousands of coupons at once, email to customers, add them to WooCommerce and export to CSV to share with partners. Or import via CSV. Issue coupons on product purchase – sell gift vouchers or give a discount on other products on purchase of one product. Great for upsells, downsells and to encourage repeat sales! Comprehensive Store Credit system – customers can maintain, top-up and purchase from their fund balance. Grows customer lifetime value. There is much more to Smart Coupons though… Read the documentation for detailed guides on using Smart Coupons on your site. Smart Coupons is one of the best selling WooCommerce plugins ever. It is the most comprehensive coupon, discount, gift card and store credit solution for WooCommerce. More than 10,000 WooCommerce store owners like you use Smart Coupons to increase sales, reward customers and create loyalty. People say that Smart Coupons is so amazing that it pays for itself. People double their sales with Smart Coupons during the holiday season and attribute 20% sales to Smart Coupons month on month. If we put it together, that’s probably billions of dollars of extra revenue! Back during the 2012 holiday season, we wanted to drive sales for new products. We tried a lot of things, but sales weren’t picking up. Then we got the idea to send discount coupons to existing customers. Unique coupon codes for each customer. This way we acknowledge customers for their support and create a special offer for them. As we scampered around to send this campaign just before the holiday season, we realized a big problem. WooCommerce has a solid core coupon system. But it needed manual coupon creation and dispatch. The process was to create a coupon, enter a unique coupon code, setup all coupon options, restrict the coupon to customer’s email and then save. I’d even have to keep a track of all this and send emails to customers – ensuring nothing goes wrong. It created and emailed thousands of coupons in a matter of minutes. And yeah, we also recorded the highest ever sales that season! All thanks to coupons. And the little WooCommerce plugin I built. Look, I never compromise on reliability and ease of use. We’ve created the most elegant – yet the most powerful – coupon system for WooCommerce; and I am proud of it. We fully understand that a broken coupon system can bring down the entire checkout process and frustrate customers. It can jeopardize any marketing campaign. That’s why we take great pains to create a robust, fast and confusion-free experience for your customers. Smart Coupons can handle thousands of coupons. It is useful in dozens of situations. It’s proven and tested in a variety of conditions, with most other WooCommerce plugins and themes. You can expect to grow sales with Smart Coupons. You can expect higher conversions. And you can expect we will support you, and keep improving the plugin. Smart Coupons positively impacts customer experience, conversions and revenues. Developers, store owners, and end users – they all love this plugin. From getting started to using it day in and out, Smart Coupons provides the most advanced and “all-in-one” coupon solution for WooCommerce. Whether you want to offer store credits, generate a bunch of coupons for a promotion or provide links to customers with coupons embedded in them, whether you want to style coupons to your branding or allow gifting; Smart Coupons covers it all! Here are some quick actions you can take on your store to grow sales and wow customers – even today! Find out your average order size – let’s say $175. Create a Store Credit / Gift Certificate coupon for a higher amount – $250. Create a new product and price it at a value slightly above average order size. In this case, the new product can be priced at $200. Ensure the discount is lucrative enough. What you’ve just done is attracted your customers with a good discount, made them pay in advance, and continue spending in future to deplete their credit balance. Create a discount coupon and allow usage only on a specific higher priced product. Link this coupon with a related lower priced product. This way more people will buy the lower priced product and many of them will convert to a higher priced product as well. More the merrier! Create multiple coupons of varying denominations and offer them on one or more products. Customers always like a steal! Create a discount/credit coupon that is valid between a particular time range. Smartly price the coupon. Promote the offer in advance, you can even keep raising offer price as coupon start time comes closer. This will create scarcity and prompt people to buy more and buy earlier. Generate a bunch of coupons – and export them to a CSV file. Now share this CSV file with the “deals” site, so they can issue one coupon to each purchaser. You can import the CSV file back into your store so when buyers use the coupon, they get the promised deal. To make for a seamless experience, give a direct link to the product on offer with the generated coupon in the URL. Create a new page in WordPress, link it from a prominent place on your site. And use shortcodes to display coupons for offers you have currently available. You can even use images, link them to a product page and pass the coupon code in the URL. People looking for deals will find this irresistible! The best thing about Smart Coupons is that it is used by more than ten thousand people, it’s fully tested and covers almost everything you may want to do with coupons. Not only does it improve the built-in coupons system, but it also adds new business-centric features – helping you make more money with less work! Plus it comes with detailed documentation and awesome support. If you want the best coupon solution for WooCommerce, this is it. You can count on it to work and it will generate a return on your investment quickly. Really… You can confidently buy Smart Coupons. So pick up your subscription option and get started! Seems like a great concept but it's got issues. The Bulk Generate generates a file that is then not allowed to be imported if you need the coupon to be limited to 1 usage and limited to 1 product in the cart. The documentation was updated to 3.4 but the download wasn't available yet for 3.4. Otherwise, it seems like a great idea, just wish it would live up to the promises it's making. Now I have to go through the 250 gift cards I just bulk generated and manually one-by-one select that it needs to be limited to one product and one usage. Get it together and don’t overpromise and then release a buggy product. Version 3.4.0 was available from 17th April. I don’t know why it was not available for download on 20th April. We’ve released version 3.4.1 including the fix for import related issue. Please check if it is available for download. If not, inform us, we’ll check it with WooCommerce team. And, make sure your store is connected to WooCommerce.com for the update to show. A simple list view for a Specific Coupon’s Usage or Store Credit Usage history is missing. Sometimes admin needs to know where a specific coupon has been used. Currently this requires orders to be exported and filtered for the coupon in question. Especially Store Credit Users would find it handy to see the history of credit received and used, which would avoid such queries to admin, who also do not have a fast and easy way to provide this information. Works well. Does what it says. I wish I could adjust the wording of the emails that get sent notifying the user that they received a coupon. Also, there seems to be an incompatibility with Handsome Checkout that forced me to use CSS to hide the questions about where to send the coupon codes, because it wasn’t working. The plugin is easy to install and configure, the tutorials are quite easy to understand, and there are options for almost any scenario. And, if stuck, support is both fast and friendly. Would definitely recommend. Good plugin to use and very quick response. More coupon style to choose or easier way to modify would be great. can’t think of anything at this time being. Well explained. Perfect Functionality. So far no Problems. It is running more than one year on my Website. This is a very flexible coupon plugin with support quick and helpful support! Could have a bit more Woocommerce bookings integration, but anything can be accomplished with filters. Does exactly what it says, cleanly and efficiently. Works perfectly for our team! Works as expected, great support too. Would be a good idea to let us chose wether or not the customer is able to send the coupon to himself or to send it to someone else (in my case, I would like to hide this choice from the customer). Purchased this to offer gift certificates, but find the ease of other uses make it a keeper. I am giving customers $1 credit for each product review and a $5 credit for finding errors and problems. This plugin allows me to add a username to the credit and allow them to use it only once and specify that they can use it along with a weekly sale coupon. I also give every new customer a 10% discount but don't allow it to be used with any other coupon. Not only was all this super easy for me to setup and maintain, but this is easier than promo code for users because all they have to do it click on the coupon. I would like to change the text ‘click on a coupon to apply’ to something like ‘click on a coupon to apply to type the promo code on the coupon into the promo code field’. This is because sometimes clicking on a coupon doesn’t work (maybe because of browser cache issues) and while they can type in the promo code on the coupon to apply it, the text doesn’t let the customer know this is possible. This has some very nice features and is exactly what my customer wanted. The support is also very good and attentive. It would be really nice if you had the ability to upload graphic/image for coupon display. I haven't discovered all the features yet but what I've used I find great and already see people using the 'new customer' coupon. I've had contact with the maker of this plugin and must say that his help was perfect and quick. I definitely recommend giving the smart coupons a try! I told the maker of the plugin what I thought could be improved and he did that right away. So right now, I don’t have other ideas what could be improved. Is this app perfect? Is any app perfect? No, but this app incorporates more features than any other coupon app we have found, and we are finding clever marketing uses for them. Having the ability to attach a product to a coupon code has endless possibilities. And offering discount codes that can include or exclude shipping is brilliant. What really gets the 5-star rating is the customer support! Customer support is outstanding. These guys really understand the app, and understand an issue you describe. Support is accurate, relevant and prompt. Please don't change this and I will be a customer for many years. 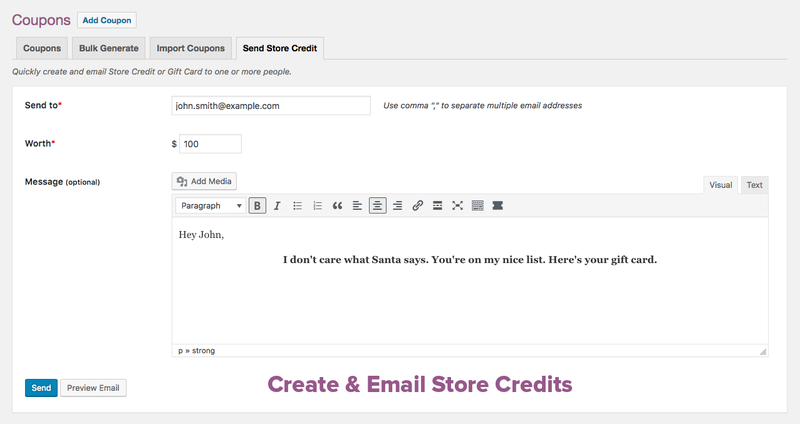 Allow for easier customization of emails sent from app to customer. Easier customization of, or more options for smart coupon design. Still a 5-star app though! Smart Coupons does exactly what I need it to. Highly recommended. My theme had a conflict with coupon colors, and support was very fast and helpful in solving the problem for me. Make sure coupons background color and text color css doesn’t clash with theme color settings. Allow us to upload an image of a gift certificate to use and automatically add the coupon code and customer’s name. Very flexible. Can be tricky because you can add coupons and store credits in so many ways, but their support is very responsive and will walk you through an questions. I would ask for more documentation, but that's only because we use Smart Coupons for very specific uses. When we wanted to make sure we were setting the coupon up right, they replied to us within a day and got the answers we needed. More documentation about specific coupon needs, based on user questions. Its a great tool for business, love the product. Possibly adding a beginning day coupons start rather than just expiration dates. Other than that its been great for our website. Thank you! Very nice plugin. What you need for a coupon mostly included. Tutorials could be more detailed. And please add more choices to coupon validity settings. Timers, setting up between two fixed time etc. Works very well adding specific features and parameters to coupons in WooCommerce. We use the feature that lets you send out a coupon with a specific product order all the time, and just set up a Gift Certificate product, which was really easy! Support is great and quick. Very happy with our purchase! Perhaps a little more customization on the coupons themselves would be nice so that we have more control over the look if it. The latest version is definitely a step in that direction but having more thorough customization (for those that want it) would be great! Supports our use cases and customer service is great! split coupon list view between admin created coupons vs. user/frontend generated coupons for easier management of coupon codes. This is a powerful tool! I put it to use right away and haven't even scratched the surface of its potential. Wonderful support! I had a CSS issue with the gift certificate on the checkout page and Mansi responded to my support request and solved the problem quickly. I weighed the pros and cons of several different products before choosing this one. I'm glad I did. Just got my suggestion implemented; the plugin can now create shorter coupon codes also. It does everything it says! My clients have become complete self sufficient and can create coupon codes without any trouble. No suggestions at this point. We use this to create store credits and coupons. I have no complaints. I have no complaints. Works well. Amazingjly good and versatile, I'm using Store Credit for upsells and it works great. Add the option to not use the Store Credit to pay for upcoming subscriptions but only for simple products.